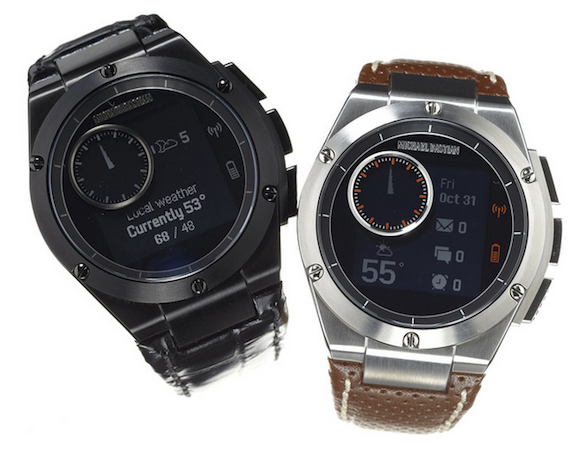 The world of smartwatches is a huge and varied one. However, it is a relatively new sub-section of the wearables industry and, thus, does experience its own share of growing pains. One of the biggest complaints lobbed at the smartwatch industry is that they aren’t made to look like high end watches, settling on plastic looking thingamabobbies instead. There have been some in-roads on this front. The Pebble Steele is pretty snazzy looking, as is the Moto 360. However, maybe the industry saved the best for last. HP has teamed up with some designers to create a smartwatch that is as beautiful as it is functional. The popular computer manufacturer has teamed up with fashion designer Michael Bastien to create the MB Chronowing. The MB stands for the designer’s name and the Chronowing stands for, uh, something having to do with flying through time or something. In any event, upon first blush you can see how classy and professional this smartwatch looks. The days of dumb plastic bands are over. As far as functionality goes, it handles most of the things consumers have become accustomed to in the world of smartwatches. It interacts with your phone, iOS or Android, it controls your music library, displays texts, emails and just about anything else. Also, did we mention that it looks really nice? The Chronowing will be available later this week on Gilt, clocking in at a reasonable $349 for the base model and $649 for the super snazzy model with sapphire glass and alligator leather.